Photo by Polish American Folk Dance Company of Brooklyn. CLARK—The Polish Cultural Foundation in Clark will present the annual Polish Harvest Festival on Sunday, Sept. 21 at 3 p.m. There will be plenty of Polish ethnic food available as well as cash bar. Music by D.J. Jaroslaw Kaczynski will play all evening for dancing pleasure. John Niemczyk of Mountainside will MC the event. All are invited to attend this colorful event highlighting 1000 years of Polish tradition. 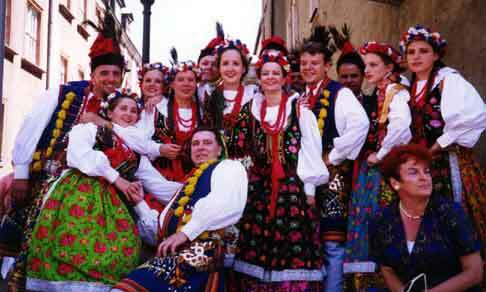 The Polish American Folk Dance Company of Brooklyn, a group well known in the Metropolitan area will lead the Festival Program Dressed in colorful, regional costumes; they will entertain all in their presentation of the harvest with folk dances and traditional couplets (humorous folk songs). This is a great occasion to wear your Polish costume – as well as to dress your children in their costumes. After the program, children will be having a great time playing games, etc. under the auspices of the Polish Girl Scouts. The Dozynki or Harvest Celebration is by far considered to be one of Poland’s most revered traditions. For 1000 years in Poland, the tenant farmers presented the Lord and the Lady of the Manor with gifts and garlands of wheat and wild flowers as part of a joyous fall celebration of the harvest. Since Poland is and always has been an agrarian society, much importance was placed on the harvest because it represents the fruits of the farmers’ labors, as well as their ability to sustain themselves throughout the winter months. In gratitude, the “starosta” or lord of the Manor shares food, drink and music with his tenants. A procession of farmers with their implements, presenters and dancers in regional costumes accompanied by musicians will initiate the festival. The festival consists of two parts: processional songs honoring the harvest, which are solemn in nature and reaffirm the reverence of the tradition; and the general celebration during which the celebrants return dressed in holiday finery to sing, dance, feast and play games. Dozynki reminds us today of our inherent connection to the land and to nature itself. Without the land, both in the past and present, there is no bread or life and indeed, no cause for celebration. Dozynki celebrations vary from region to region. The Polish Cultural Foundation is located at 177 Broadway in Clark, just off Exit 135 of the Garden State Parkway. Tickets for the festival are $8 adults, children under the age 12 are invited to attend free of charge.